« Diet sodas are just as damaging as a regular sodas at weakening tooth enamel. Using tobacco can harm your mouth, including your teeth and gums, in a number of ways. There is no safe form of tobacco— using it produces many problems and risk factors, from tooth discoloration and gum disease to throat, lung, and oral cancer, and, ultimately, even death. It’s important to understand what happens to your mouth when you use any form of tobacco, and to discuss those effects—and how to quit—with your dentist and physician. What happens to my mouth when I smoke? Smoking reduces blood flow and the supply of vital nutrients to your gums, including vitamin C. Without the proper nutrients, you can develop gum disease, bone loss, and even tooth loss. This is because smoking triggers the accumulation of bacteria in plaque. Smoking also reduces the amount of saliva that flows through your mouth. Saliva is important for cleaning your mouth and preventing tooth decay. In addition, when you smoke, the temperature in your mouth increases and the heat kills important cells in your mouth. You also can see the effects of tobacco use. Nicotine and tar, the major ingredients of cigarettes, discolor your teeth—yellow and brown stains will appear and the sticky tar deposits will adhere to crevices. The roof of your mouth will become inflamed and turn red. You also will lose a lot of your sense of taste, and the smell of your breath may become offensive. No! Just because you don’t smoke the tobacco, it doesn’t mean that there aren’t harmful effects. Smokeless tobacco—which includes snuff, dip, or chewing tobacco—eats away at your gums, exponentially increasing the chances for gum disease. You also are four to six times more likely to develop oral cancer from chewing tobacco. In fact, the area of your mouth where you place the tobacco is 50 times more likely to be the site of an oral cancer. Cigars contain the same toxic and carcinogenic compounds that cigarettes do, and even though you might not inhale cigar smoke, cigars are not a safe alternative. Regular cigar smoking increases the risk for oral cancers, lung cancer, and larynx and esophageal cancers. Oral cancer can develop at any time. It’s important to know what to look for and to tell your dentist and physician right away if you have any concerns. If you experience any sign of irritation, like tenderness, burning, or a sore that will not heal, tell your dentist or physician. Also, tell your dentist or physician if you have pain, tenderness, or numbness anywhere in your mouth or lips. The development of a lump or a wrinkled or bumpy patch inside your mouth also can be a sign of oral cancer. In addition, if the tissues in your mouth change color to gray, red, or white, make an appointment to see your dentist or physician. What can I do to stop the effects? 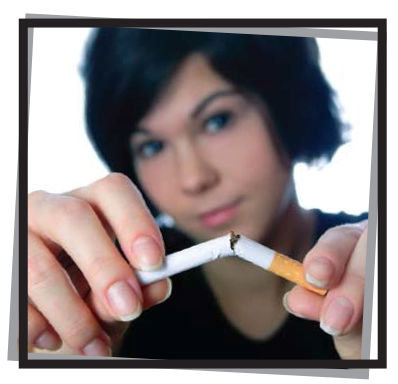 The most obvious way to stop the effects of smoking and tobacco use on your mouth—and body—is by quitting. Although it can be extremely difficult to quit because the toxins in tobacco products are addictive, there are ways to stop using tobacco. Call us about proven ways to stop smoking today.